Saukshmya practices intellectual property law with an emphasis on patent and trademark litigation. She has prior experience advising multinational and Indian companies from a broad range of industries, including pharmaceuticals, renewable energy, FMCG and hospitality services in contentious cases before the Indian courts. Saukshmya is a member of teams providing counsel on ANDA disputes, and other matters. 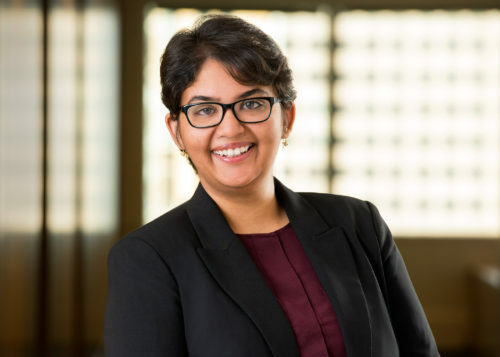 Saukshmya regularly draws on her deep experience and training in genetics, biotechnology and chemistry to draft effective briefs and legal opinions, conduct research into niche areas of intellectual property law, and assist counsel with arguments and depositions. She has also provided pro bono representation through the Pro Se Project and has volunteered for the 2017 United States District Court – District of Minnesota’s Open Doors to Federal Courts program. Saukshmya has contributed articles to the Harvard Journal of Law and Technology Digest (JOLT), The Intellectual Property Review, Global Patent Litigation and the Multi-Jurisdictional Guide 2012: Life Sciences. In addition to speaking English fluently, Saukshmya is a native speaker of Hindi, Tamil and Telugu.